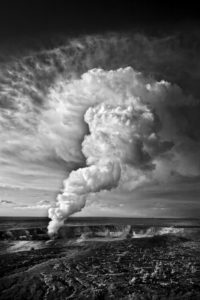 Literature of Kīlauea: Contemporary Voices presents an evening of poets, novelists, bloggers, biographers, and journal writers reading their own and others’ work about Kīlauea. Come hear the varied and powerful voices of this wide-ranging community of island writers, each recognized for a unique voice and view of this living volcano. Featuring readings and works by Tom Peek, Garrett Hongo, Caroline Garrett, Bobby Camara, Kathy Banggo, Susan Schultz, and more, with imagery by Ken Goodrich. The Literature of Kīlauea Program Series was developed months before the eruptive phase. In the light of the volcano’s recent activity, hearing of Kīlauea in its many manifestations becomes even more vivid and essential. Join us for the second program of this series — a rich and entertaining evening revealing the ever-expanding saga of Kīlauea. This event is free, although a $5 donation to Volcano Art Center is greatly appreciated. For more information, please call VAC at (808) 967-8222 or visit www.volcanoartcenter.org.